There are less than eleven days to go and we’ve been holding steady right around $13,000 with just over 220 backers. I know this seems like a much slower project than the Babes™ Kickstarter run. This is one is just structured much differently than the last one. The Bomb Factory crew have knocked our heads together and we cannot seem to structure including any other pledge levels regarding individual Maelee pieces other than the current add-on solo offered from the stretch goal. Any tampering at this point would unbalance the value of the existing rewards levels and possibly upset some of our current backers. Thanks for your understanding and remaining support. We want to make it as fair to as many backers as we can. 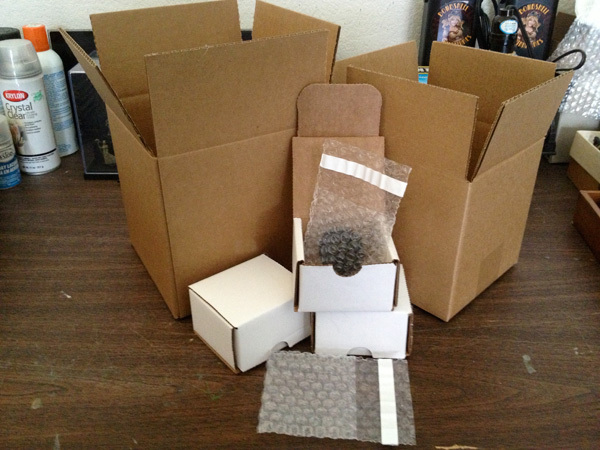 The boxes for the sets came in along with the shipment of packing materials. Valiant has made the initial master molds for the metal pieces and the resin base piece. I received notification this morning that the shipment of proofs and paint master shipped out and should be here later in the week. There will be another update with pics when I receive the castings. I will also be working on laying out the certificates, printing them, signing them, and numbering them this week. I plan to number the certificates and then stamp that number on the outside of the box so it will be easy to tell which set is which in the series. For GenCon, we have registered our Indiana Tax ID permit, ordered our booth fixtures and signage and received paperwork for the commercial liability insurance we are required to carry for the show. This week I’ll be working on art for the new business cards and ordering header tags to package the rest of the product we’ll be taking with us. In other news things are really starting to grow. Our initial order from WarPath Games distribution came in and we are working out the specifics of filling this order to get Bombshell Minis stocked in stores.